China has warned the United States not to send the “wrong signals” on the disputed island issue between China and Japan. “This issue should not become a problem between China and the United States, and China hopes that the United States does not become a third party in this issue,” Wang Guanzhong, Deputy Chief of General Staff of China’s People’s Liberation Army (PLA) said. Wang met US Under Secretary of Defence for Policy James Miller in Beijing. “The United States should maintain a consistent stance and policy, not send wrong signals nor support and connive with the relevant country to do as they please,” Wang added. At a press conference on Tuesday, Japan’s Chief Cabinet Secretary Yoshihide Suga said that Japan is considering a permanent base for Japanese civil servants on the islands. 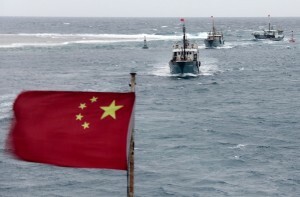 The Chinese Foreign Ministry said that China would be forced to respond to such “aggression”. “If the Japanese side deliberately resorts to provocations, it must shoulder all the consequences,” Foreign ministry Spokesman Hong Lei said in Beijing on Tuesday. Japan purchased three of the islands from a private owner last September, announcing plans to “nationalise” them. A top US official on Wednesday reaffirmed American backing for Japan in its dispute with China over the islands. A security treaty with Japan would allow the US to protect its ally in case of “foreign intervention”. US Deputy Secretary of State William Burns expressed his views in a meeting with Japan’s ruling party lawmaker Natsuo Yamaguchi on Wednesday. The US “pivot to Asia” strategy announced by the Obama administration has also attracted criticism from China which sees this as an attempt by Washington to contain the rise of Beijing. US marines have already been stationed in Australia as part of the Asia “rebalancing” strategy. Meanwhile, the Commander of China’s People’s Liberation Army Navy, Admiral Wu Shengli has held talks with his American counterpart Admiral Jonathan Greenert in Washington. The two sides are preparing for the upcoming naval exercises in the Pacifim rim in 2014.